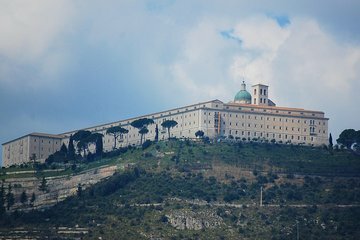 Spend a full day exploring the historic town of Cassino with this day trip from Rome. Get picked up at your hotel in central Rome by a professional driver in a luxury minivan. Enjoy the scenery during the 1.5-hour drive to the Abbey of Montecassino. Hear about the abbey from your driver and guide before you arrive. Take a self-guided tour of the abbey, originally built in the 6th century and rebuilt to repair damage after World War II. Visit the museum after your tour of the abbey, if you like, for another self-guided tour. Travel from the abbey to a hilltop restaurant nearby. Enjoy lunch with incredible views of Cassino and the surrounding area. Make the return drive to Rome after you've finished your meal. Nice driver and pleasant drive to Cassino from our Rome hotel. Our guide / historianAnna Maria that met us in Cassino was excellent. The tour would not have been as interesting if not for her. She took an interest in the reasons we wanted to visit Montecassino and answered all questions that we put to her. Highly recommended for anyone with an interest in WWII and the battle in Cassino. A fantastic tour and for an extra fee we had an amazing tour guide. The ride to and from was super comfortable and driver was excellent. Such a fascinating place to visit.